It’s 4:30 am and I am drinking bad in room coffee and waiting for daylight. I’m sorry to say that the cold or whatever it is has not improved and I felt too miserable to sleep. It is going to be a long way home. Well, it would be anyway! 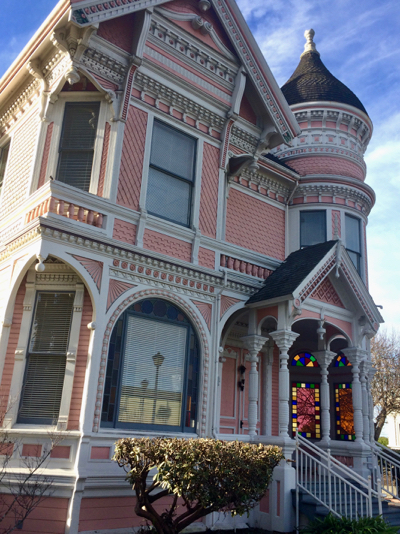 Jarrett picked me up yesterday and took me on a tour of Eureka, where he has lived for several years. Like Fort Bragg, it began with logging and fishing, and all that entails, like robber barons and brothels. But Eureka, a much bigger city still, boasted an opera house (the building still stands) and a Chinatown, populated with the people who built roads, did the logging camps’ cooking and laundry and basically kept to themselves until they were all deported to San Francisco in 1885. 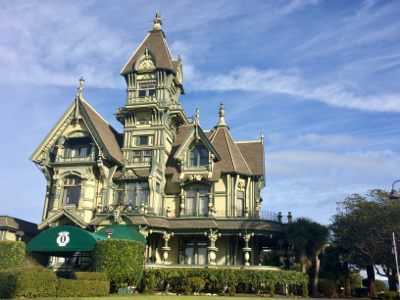 It is utterly magnificent and may be the finest Victorian home I have ever seen, even after living in San Francisco for so many years. It is now a private club, which is whispered about among locals, much as the Bohemian Club is in San Francisco. Though we peasants cannot enter its splendid interior, you can revel in its elegant excess here. Love the color and the stained glass. We walked around the historic downtown, and I really liked the combination of old and new. The town feels vital and young, not precious like the Village at home. I really enjoyed our look around. We also stopped in at the local history museum, which has a great collection of Native artifacts and pioneer quilts. Needless to say the native people, like the Chinese, were also driven out by Europeans, just as they were in Fort Bragg. The age old story, I’m afraid. We headed out to dinner with Jarrett’s beautiful girlfriend Kalli at one of their favorite spots. It was so wonderful to catch up on their news and spend some time together. I love those kids. I’d have to say: despite the cold or whatever it is and the long drive ahead of me, I’m glad I came. Update: Left in the rainy darkness about 6:45 am. Stopped at the gas station and then headed straight for home. No traffic that early, though I did have to drive around two large, shaggy elk on Highway One. Arrived home a little after 10 am. Whew! Glad you had a great time with your friends and you had to privilege to visit those beautiful places. Have a safe trip home. Thanks for the ride.